Congratulations to our very own Ryan Danzinger on his prestigious suburban leadership award! Thank you so much to our delegates for attending the 2016 NEA-RA in Washington DC this year! Below are some of the pictures taken during the RA. Please feel free to send more and showcase your experiences! Please click on the photo below to read the article. Follow the link below to see what Oregon teachers did to call out corporations to pay their fair share. Please click on the photo below to be taken to the link. Daily Herald feature for Cahty Weadley! Congratulations! 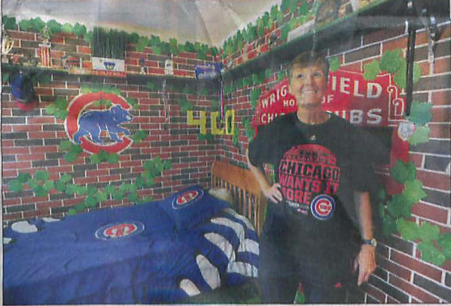 Cathy is recognized for her great artistry and kindness to Cubs fans and their homes! Below is a link to the video, a photo and the PDF attachment of the article. Amazing work Cathy! SCORE Grant Award to a Region 43 Member! Congratulations to Kristin Maksymec from Local ATA 25 for receiving a SCORE Grant! The following is a piece of the e-mail received from Meredith Byers who helps facilitate the SCORE Grant Dispersal. This is the third year for IEA SCORE! More than 130 applications from IEA early career members were received! Applications were carefully reviewed by the project team and recommendations shared with an advisory group. 51 applications from 28 different regions were recommended for funding. We were so impressed with the variety and creativity of the applications! Special attention was considered for applications that demonstrated the needs of the community or school, an established partnership, potential for impact, and involvement of others. We will be working with many recipients to develop a more thorough communications plan. We anticipate positive press coverage and the use of social media. Be on the lookout for #IEAhelpsout and help us by retweeting!